An inefficient service desk ticketing system can cause huge problems in any sized organization. Your customers’ service desk tickets are often lost, or unaccounted for, or some end users may refuse to use an inefficient ticketing system at all, leaving issues undocumented. This was true for Onestop IT, a managed services provider with a legacy service desk solution. 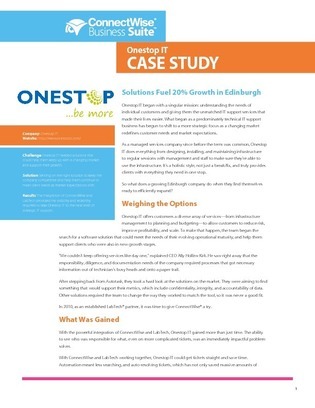 Read this case study to see how Onestop IT overcame this challenge, and how your customers may be able to do the same.